Bonjour my friends! I have returned from my adventure to Paris and Munich which I embarked on September 20th through September 29th. It is astronomically difficult for me to answer the question, “How was your trip?” I think a few words I have used in response have been phenomenal, incredible, and wonderful. Truly, this venture was one that I will always remember for the rest of my days as it was enriching and of course, fun! I now sit in my apartment, recovering from jetlag; I find it a real challenge to summarize such a wonderful travel experience. What to write about? What stories to tell? If I go documenting every day of my journey with every single sight I saw and meal I had, well, we’d have half a travel book on our hands. Instead, I think I will touch on a few different topics from my travels that made my vacation so spectacular. Paris is where I spent the majority of my time. Like everyone, I have grown up looking at images of the Eiffel Tower and the Arc du Triumph, I have been to people’s homes and restaurants where all of the décor is “Parisian”, and I have watched countless travel shows about how wonderful a city Paris is. 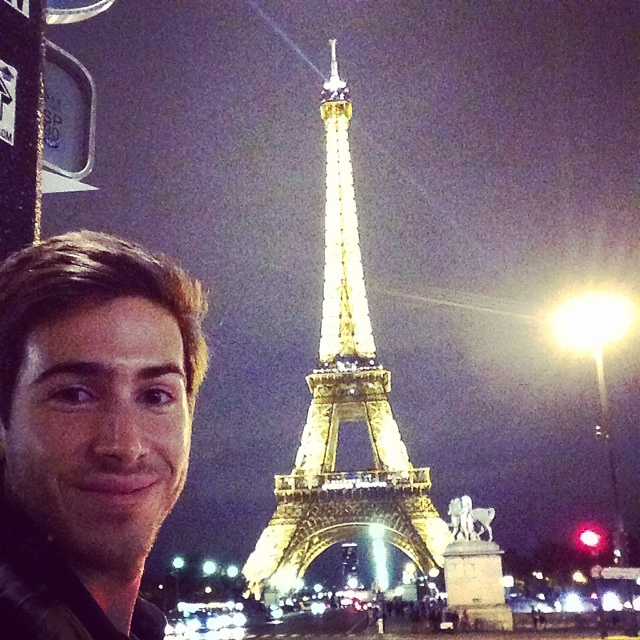 All of these factors made Paris a top destination for me, a bucket list city to hit. I finally decided to book my trip and visit this iconic city, and it did not disappoint. Paris really is a wonder. Every corner café, every bridge over the Seine, every historic building is a real life painting. Paris pulses with energy; artistic, historic, excitable, and relaxed all at once. There is much to see and do in this famous city. I gave myself a good amount of time in Paris so that I could find a balance of sightseeing as well as dwelling like a local and wandering about. All the sights, I saw: the tower, the arc, the Opera, the Louvre, Versailles; I am very happy that I have now experienced those unique places. Equally exciting, in my opinion, is the fact that I was also able to wander through local neighborhoods and in and out of cafes, restaurants, and markets. I stayed at an Airbnb in a mostly non-toursity neighborhood, the St. Martin Canal District, and was therefore able to rise and have my morning pastries and coffee amongst local Parisians during their normal morning routines. I explored other neighborhoods and was able to wander the streets, see where people lived, see where they ate and drank – and eat and drink there myself too – and shop where they shop. In this way, I feel like I got a good sense of what it is like to be Parisian and live in such a city. I saw the tourist side of Paris which is wonderful, but I think I saw that real side too and that is often what I love the most. Sacre Coeur – a Cathedral on a hill that is the highest point in Paris and overlooks the entire city. The Cathedral itself is breathtaking, and the view from it even more so. I went here both at sunrise and at sunset and was floored. I was watching the sunrise/sunset over Paris, France. Both times were wonderful, humbling experiences. I suggest you take the time to climb the Duomo of the Cathedral as well for the truly highest view in the city. River Cruise on the Seine – a great way to see the city from the water of the famous Seine. You pass many of the major sights and it gives you a unique viewpoint of the city. Picnics in Monceau Park and the Luxembourg Gardens – it’s easy to get caught up in the rush of Paris, whizzing from sight to sight to make sure you get everything in. However, they say that Paris is best enjoyed slowly. Take your time with your coffee and your wine, leisurely stroll the streets, and sit and enjoy what’s around you. I loved sitting in Monceau Park and the Luxembourg Gardens, 2 hours at each on separate days, and eating French delicacies and reading my book. It is so peaceful and romantic to lounge, to read, and to eat in the gardens of Paris. The Latin Quarter – there are lots of different neighborhoods in Paris, each with their own flavor, and the Latin Quarter was my favorite. Though it is quite touristy, the energy in this neighborhood is lively and spicy. Many of the street corners in this area are what you picture Paris looking like in your head; lots of cafes packed with people from all over the world, apartments with flower boxes hanging outside the window, crepes being served from carts off the street. It’s a very fun area with a lot of great food and tiny streets to stroll down. If I were to live in Paris, it would be in this neighborhood. The Markets – I love going to local markets wherever I travel; you get to see what the people there buy and sell, what they eat, and how they operate. I love French and Italian markets because there are no giant grocery stores; you go to the cheese shop, the bakery, the meat shop, and the produce shop – all separately. Each shop is dedicated to one grocery category and this seems to ensure better quality. I loved buying cheese from the Fromagerie, baguettes from the Patisserie, and local produce from the little fruit and vegetable shop. It was fun to shop among locals picking up food for home and really enjoy the products that France has to offer. Sitting in the Luxembourg Gardens with Chocolates and my book. Sitting in the Luxembourg Gardrens with chocolates and my book. Having a picnic in Monceau Park. Now, I am Johnny La Pasta, and as you know I am ALL about good food. France is one of the gastronomic countries in the world, and so when you travel there it is obligatory to eat your way around with reckless abandon. The food was one of the biggest reasons I was thrilled to visit Paris: the pastries, the bread, the crepes, the cheese, the delicate and refined sauces, I wanted it all and I did indeed get it all. Here were some of my favorites! Pastries – forget your American bacon and eggs or your yogi acai bowl; when you are in Paris your breakfast should be exclusively pastries! Every morning, I went to local Patisserie in the St. Martin Canal district and picked up at least 2 pastries for breakfast. The options extend far beyond croissants; every morning the Parisians produce fresh, warm pastries of all kinds for your enjoyment.I, of course, enjoyed their buttery, flaky croissants; they are just classic. However, I discovered some other really exciting pastries as well! Escargot au Raisin – a wrapped pastry, similar to a cinnamon roll, but filled with raisins and a citrus sauce. They also come in a pistachio and chocolate version that is equally divine; I couldn’t get enough of my Escargot au Raisins! Pain au Pommes –this translates to Apple Bread. It is very similar to banana bread, but much more moist and cake like with a distinct apple cinnamon flavor. This was one of the first pastries I ate in Paris and I could’ve cried at its delicious flavor and delectable composure. Finally, my favorite of the pastries: Croissant aux Amandes – This is basically an almond bear claw with powdered sugar all over it. It is crunchy on the outside and soft and flaky on the inside with a pronounced almond flavor and the perfect amount of sweetness. This is one I could have every day, and in fact did have every day after I discovered its heavenly nature. I suggest to you to try as many pastries as you can while you are in Paris because you will never find any like them here in the States or anywhere else in the world! Street Crepes – If you don’t have crepes while you are in Paris, you are doing it wrong! Crepes in Paris are made quickly in your sight in a cart or stand, folded into a triangle, slid into a paper cone, and handed to you to eat casually as you stroll or sit and enjoy the sights around you. They are very affordable, quick, and good Lord are they ridiculously good! You can go sweet or savory. For a snack, yes – a snack – I had a cheese crepe that was an even dopier version of a grilled cheese if you can image. The real crepe winner, however, is the now classic Nutella Crepe. You can order this crepe with Nutella and bananas, Nutella and almonds, and so on and so forth; in any form it is all consuming good. Once I had had my first Nutella crepe, a crepe eating beast awoke within me and I had to have a Nutella crepe every day from that moment forward. Classic French Dishes – I feel that when you are in Paris, or anywhere in France, that there are a few classic French dishes that you simply must have. The first is Sole Meuniere – a lemon, butter fish dish that was the first dish Julia Child ate upon arriving in Paris and where her love of French cooking began. I had Sole Meuniere on my first night in the city and could have cried. The fish was flaky, buttery, tangy, and smooth; a truly masterful dish. Served with roasted fingerling potatoes drizzled in, you guessed it, more butter! Absolutely sensational. Another must have, Beef Bourguignon, the classic peasant beef stew. It is savory, hearty, and warming on a chilly Parisian night. It is simple, but in the best possible way with those tender chunks of beef, delicately braised vegetables, and a comforting broth. Don’t skip out on this one! French Onion Soup, though since you are in France it is simply known as Onion Soup, is another must. A savory and warming soup of onions, spices, and broth underneath floating crusty bread slices that are buried underneath a lawn of melted French cheese. Just wow! Though it is only soup, this dish is so incredibly satisfying and comforting. Croque Monsieur is a perfectly classic French lunch that can be enjoyed from street vendors or at a small daytime café. Basically, Croque Monsieur is a dressed up version of grilled cheese with fresh bread, French cheese, and ham. The cheese is both inside the bread and on top of it as well. Warmed to the perfect temperature and with the bread at the perfect crunch level. Enjoy with a bit of green salad and a side of real Dijon mustard. Again, simple yet delightful! Picnics with goods from the local markets – this was one of my favorite parts of my trip. All the food from the markets is so, so, so fresh! The bread is freshly baked, the cheese was made from local cows on grassy farms where the animals are treated well, the produce is organic and harvested by local farmers. It is a real treat to get a few of these items, sit in a park, and enjoy each of them. My favorite was sitting in Monceau Park with a fresh baguette, wedges of the purest bleu and brie cheeses, and fresh vegetables and figs. Every bite, though simple, was divine. A breakfast of pastries and a latte in Paris is the best. Pastry breakfast in the park. This is that Crossiant aux Amandes that was life. Me so happy with my Nutella, banana, and coconut crepe. A Nutella and Banana crepe under the Eiffel Tower. Sole Meuniere straight out of heaven! French Onion Soup! Look at that cheese layer! Definitely have a picnic of local goods for a taste of authentic Paris. I ate that entire wedge of bleu cheese, it was that pure and good! Basically, everything you eat will be incredible. They take a lot of care and pride in the raising, harvesting, and preparation of their food that we are often hard pressed to find here in the Sates. I suggest that you go with a big appetite and try everything; not only see Paris, but taste it too! Now, I spent most of my time in Paris, but I also made it over to Munich, Germany as well! When originally booking the trip, I had planned to just stay in Paris with perhaps a day trip out into the countryside. Later, however, I discovered that one of my fellow yoga teacher friends who I trained with was heading to Oktoberfest in Munich while I would already be in Europe. She invited me to join and stay with her, her husband, and another couple of friends for THE ORIGINAL OKTOBERFEST. And how could I say no to that? After a train ride that allowed me to see the glorious French and German country sides with rolling hills, thick forests, and hill nestled towns, I made it to the insanely energetic city that is Munich during the Oktoberfest season. I had a bit of trouble getting in touch with my friends because of an inability to get onto WiFi to contact them, but once I finally found them I had a truly amazing time for the rest of my stay in Germany! That first night, I got to experience the craziness of the original Hofbrauhaus beer garden as I wandered through the chaos of this famous establishment in search of my friends as people from all around the world, dressed in lederhosen, swayed to the German band playing from the center of the building, drank, cheered, and some of them even getting on top of tables. I finally met up with my friends at Augustiner, one of the most famous pubs in Munich and got to catch up with them and some new British friends who had sat with them. Everyone was in bright, warm spirits in the cozy Bavarian atmosphere. Of course, I had a liter – yes, a liter – of the absolutely phenomenal and all-to-smooth beer, and I had an incredible German Potato Dumpling dish that completely took me by surprise. I really didn’t expect the food to be anything special in Germany, but it was really, really good! Met up with my “Omie” (Homie from yoga teacher training Leilani)! Augustiner Pub with old friends and new ones! My liter of beer at the pub! I got to explore the town a bit with my friends before turning in. The next day, we were at it bright and early to hit up the original Oktoberfest. I bought my lederhosen to match my friends, and actually fit in because everyone at Oktoberfest wears the stuff, and we got into the Augustiner tent at 9am. Oktoberfest is so famous now, that it is challenging to get a table in one of the tents if you don’t get there early. Luckily, we actually grabbed a table, and the iconicness of it made us so joyful: we were in lederhosen, in the Augustiner tent, with our own table, at the original Oktoberfest! And so, naturally, we celebrated with more liters of beer and giant, fresh, salty pretzels (this was essentially our breakfast). We stayed at the table for a couple hours swaying like so to the German band and chatting with people from around the world. It was just a very happy time. After we had been in the tent for a while, we took to the Oktoberfest grounds to explore, to people watch, and to eat! Walking around Oktoberfest is kind of like walking around a county fair that Bavaria has thrown up all over; there are carnival rides and games, there are lots of carts and stands selling decadent food and fun trinkets, but everything has that old world German feel and everyone is dressed up! We, of course, continued to eat more from the stands; I had a traditional White Bratwurst, which I am not normally a huge fan of, but because the quality and craft are so much higher in Germany, this Bratwurst an absolute treat! We rode the Ferris Wheel, from which we were able to see just how many thousands of people had come out to party at Oktoberfest. We walked more and took it all in, the fact that we were at the Oktoberfest – a bucket list item for all of us – and then, just like that, we left. Oktoberfest was insanely fun and a truly wonderful experience that I will always cherish. 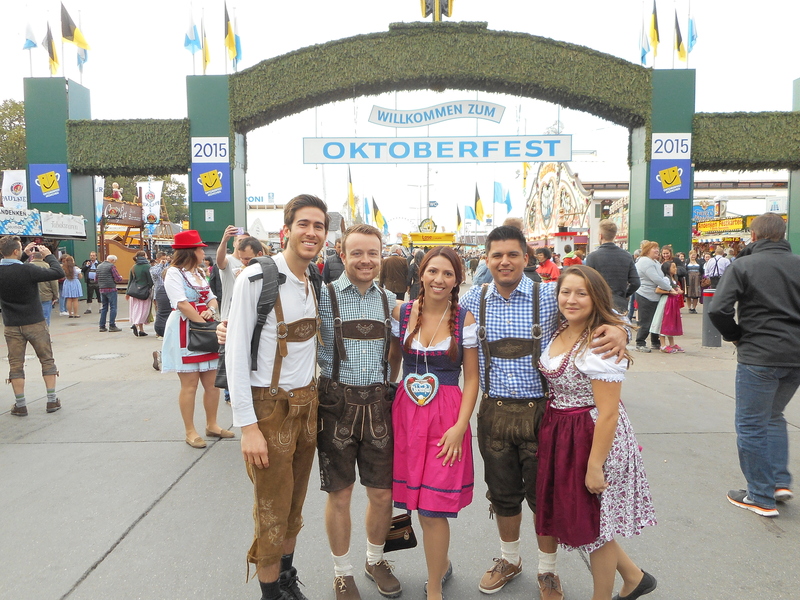 The gang in our lederhosen heading into Oktoberfest! Inside the Augustiner tent. Insane how many people were there! View from the Oktoberfest Ferris Wheel. For the rest of the day, we explored downtown Munich, still in lederhosen, which has its own old world Bavarian charm. We had dinner at a great Bavarian pub that made me feel like I had taken a step back in time and into an old German fairytale setting, and finally we turned in. That was really the extent of my time in Munich as I headed out before sunrise the next day and caught the earliest train back to Paris. My time there was filled with laughter, smiles, and of course, beer. I really loved it, and am so grateful to my friend for inviting me to join her and co. and crash with them. This entire side trip was a blast. As you can tell, I did and saw a lot in both Paris and Munich. Both the cities and everything in between were fantastical, the sites spectacular, and all the food was divine. The best part, however, was meeting new people and making new friends from all over. As I said, I was traveling alone, which there is a lot to be said for. When you travel alone, you are forced to figure everything out for yourself. I had to use a paper map (with no phone like the olden days) and navigate my way around, I learned the bus and metro system, I made myself be alone at times and be okay with that, and I put myself in situations that made me uncomfortable but helped me to grow once I worked my own way through them. More importantly, is that when you travel alone, you are bound to meet new people. When you are traveling alone: 1. You are more willing to talk to new people because, duh, you’re alone with no one to talk to, 2. People seem to want to talk to you because you are a lone solider 3. People who are traveling in general are more open to talking with strangers because they too are out of their element, more open to new experiences, and are not distracted by work and the stresses of normal daily life. All of these factors above led to me meeting a lot of great people that I can now call friends. Wandering alone, I was the master of my own universe, not tied down to solid plans or having to answer to or consult with anyone else, I was free to say “Mind if I join?” when I met a couple other Americans at the Louvre and ended up spending half the day and a meal with them, and I was free to say “Yes!” when a group of Norwegians invited me to sit with them (and buy me a drink) when they saw me dining alone at Le Chat Noir Café, and I was available to make plans with a Chilean couple that I met at dinner and basically ended up having dinner with them in the Latin Quarter to walk around and get Nutella Crepes after we had finished our meals. Alone and unrestrained, I was completely and utterly free and open to make connections with the people that God placed in my path; and this is what made this trip so rewarding and enriching. I walked away from it with friends from other places in America, Canada, England, France, Germany, Norway, Italy, Chile, and more. Though I may never see some of them again, I will always remember them because I shared moments of joy with them when I was alone in a foreign land. And it brings me such happiness to have been able to travel halfway across the world and be able to meet interesting people, connect with them, and call them friends. Met Brandy and Matt from NYC in line at the Louvre one morning and spent the rest of the day with them. Such great people that I had a lot of fun with. Very happy to have met them. Met this really kind Italian family on the boat on the Seine River cruise. I was able to speak Italian to them which is how the conversation started and then we carried on in a half Italian/half English conversation. Wonderful people to meet and befriend! I could go on and on about my travels, but as I said, we’d have a book on our hands. In the end, I would say that my trip was a true life experience that I feel has helped me to learn and to grow, and the memories that I formed are ones that I will have me forever. Hello, or I guess I should start saying, Bonjour!, because I am headed to Paris today! I will be exploring the city of lights over the next week as it has always been a top destination of mine. And bonus! I am even taking a quick side trip to Munich, Germany to meet some friends at THE Oktoberfest! Lots of adventures ahead! Travel is something I am incredibly passionate about. In fact, I find myself dreaming all day at my desk at work about the different places I want to see in the world; there are just too many! I’ve reached a point in my life where I have decided to stop waiting for the right time to travel. I am only young and single once so I have decided to make the time and just go for it as much as I possibly can. As I travel to Paris now, I travel alone once more. This time, there is no tour to hop on. I think there is much to be said about traveling alone; you are forced to be by yourself and figure out what the venture throws at you on your own, while at the same time you are also free to meet new people and quite possibly even new friends. I am simply going to wander and see what this historic and iconic city that is Paris has for me. I honestly couldn’t be more excited. I feel so free and invigorated to be embarking on this journey. If you follow me on Twitter or Instagram: @johnnylapasta I can guarantee you that you will see many, many snap shots of my trip! You can also keep up with me by searching the hashtag #johnnynparis which I will be using to tag all of my photos. I am sure I will have lots to blog about upon my return to the States! But for now, au revior!